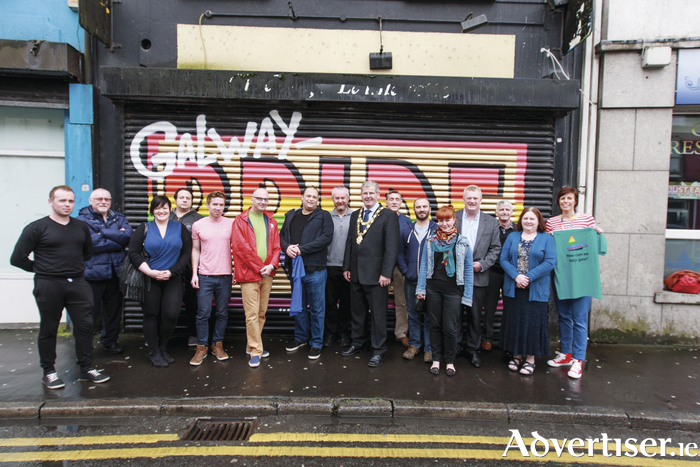 Galway Pride committee with the Mayor of Galway Frank Fahy. THERE IS lots to look forward to during this year's Galway Pride Festival which takes place next weekend. The entertainment begins on Thursday August 13 with Pride Youth Day, which is an alcohol free event in Fr Burke Park and features plenty of amenities for under 18s. The official launch of the festival takes place on Thursday 13 in Monroe's Live at 8pm with all the community invited. Well known local band The Cozy Cartel will provide entertainment on the night with finger food and wine to be served. On Friday August 14, Seven Bar on Bridge Street will host a series of lectures at 1pm, while a transgender day of remembrance will take place near the Town Hall at 5pm, with a Gender Fabulosity fashion show in NUIG's The Cube at 8pm. On Friday night The Clandestinos and DJ Ruth from Break for the Border Dublin will entertain you with a FILTHY / GORGEOUS CLUB NIGHT at Monroes Live and the theme is: Express yourself. Saturday sees the annual Pride and now Equality parade led by grand marshal Pat Carey starting at Eyre square at 1.30pm and finishing at the museum at 3.30pm, with Galway's fantastic Oddity providing festive entertainment. Johnny Garvey and his gospel choir will lead people as Community Pride hold a vigil to remember loved ones - holding a balloon release in their memory. The annual Pride Family Day and Dog Show will take place in Fr Burke Park between 4pm and 6pm on Saturday. Take yourself down west to the Pride Festival Beer Garden from 3.30pm where Sara O'Kane, local drag acts Kiki St Clair and guests, and a selection of DJ's will entertain the socks off you. This will be followed later that night by Dublin's Victoria Secret drag act and also Dublin’s Euphoria with transgender dancers in Roisin Dubh, this event being hosted by Mr Gay Ireland Marcos Vinicius. Meanwhile join the Bears as Seven, Bridge Street, host the Galway and guests Bear Night from 9pm. Monroe’s Tavern will host a Pride Brunch on Sunday with fries and Bloody Marys from 1pm with Crooners John Nolan and Sara O'Kane getting you into the party mood to embark on the annual Pride Boat Cruise on the Corrib Princess. A bus departs Monroe’s at 5.30pm and the cruise sets sail from Woodquay at 6.30pm sharp with DJ's Vinny and Tanya blasting out the seventies, eighties and nineties tunes until 8.30pm , then it is back to Monroe's Tavern to dance the night away.